TABLE OF CONTENTS / P1. Esedra by Ethimo, takes its name from this element of classical architecture to create a complete range of furniture for a contemporary outdoor look, establishing a relationship between the various materials. Relish in absolute comfort with Esedraâ&#x20AC;&#x2122;s intimate and comfortable embrace. grid BY HENRIK PEDERSEN Grid - a name that describes both function and mind-set. A grid of complementary units forms the basis of a totally flexible seating system where you can combine various individual elements to meet your s p e c i f i c n e e d s . A R e d D o t a w a r d w i n n e r, it â&#x20AC;&#x2122;s no surprise the collection has been an industry favorite since 2015. The extensive Gina collection by Piero Lissoni brings an unabashed romanticism to contemporary living, mixing tactile materials and plush seating with practical durability and modern silhouettes. Eclectic in scale and material mix, Gina offers a uniquely casual yet chic vibe indoors and out. M B R AC E b r i n g s co co o n i n g co m fo r t , i co n i c st y l e a n d a m o d e r n material mix of teak and fiber to the outdoors. Sebastian Herkner â&#x20AC;&#x2122;s award-winning collection takes its name from the welcoming gesture of the seating, which wraps users in a cozy embrace. Now available in Baltic, Sea Salt and three other colorways. Designed by Jean-Pierre Geelen, the Neo-Classic Collection incorporates Sutherland Furniture’s meticulous joinery and premier quality teak, while maintaining the designer ’s refined s e n s i b i l i t y. G e e l e n ’ s a t t e n t i o n t o d e t a i l is at the forefront of this exquisite collection. O n o n e s i d e o f t h e r e e f t h e d e e p s e a i s r o u g h , h o w e v e r, o n t h e o t h e r side of the reef is a peaceful, turquoise laguna. Comfort, welcoming and braided with natural wicker colors, the Reefside Collection will have you plunging into the peaceful laguna. Stretch by Brown Jordan, invites moments o f q u i e t r e p o s e a n d s i m p l i c i t y. C r a f t e d o f strong aluminum powder-coated finish that stands up to the elements, Stretch instantly conveys an attitude of serenity with its minimalistic feel. Stretch is a chic choice for any outdoor or casual setting. maya BY MARK GABBERTAS Maya reflects and enhances the sophistication o f t h e G l o s t e r d e s i g n p h i l o s o p h y. P a r t i c u l a r attention has been given to the materials and technologies used that are at the forefront of outdoor furniture design and that make outdoor styles as comfortable as indoor furniture. 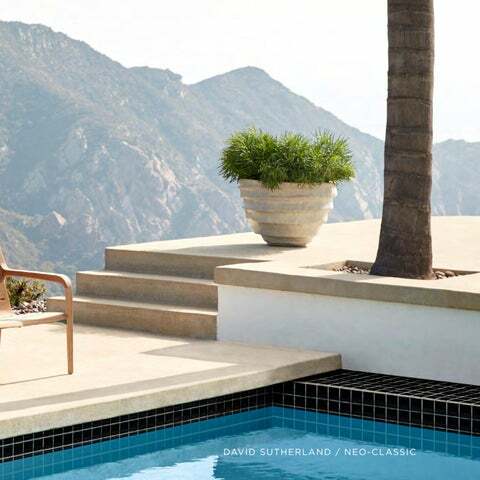 Offered in Meteor and White frame colors, the co l l e c t i o n m i xe s we l l w i t h a l l G l o ste r co l l e c t i o n s .
neo-contour BY SUTHERLAND FURNITURE The Neo-Contour collection is designed by Belgian designer Jean-Pierre Geelen, who is known for modern industrial styles that involve a technological approach. The Neo-Contour Chaise features a sleek carbon fiber frame that results in a fluid design that is also remarkably c o m f o r t a b l e d u e t o a p e r f o r m a n c e m e s h b o d y. BY HENRIK PEDERSEN Kay makes no secret of the defining factors in its design, from the dramatically curved back panel to its nod to classic French cane. 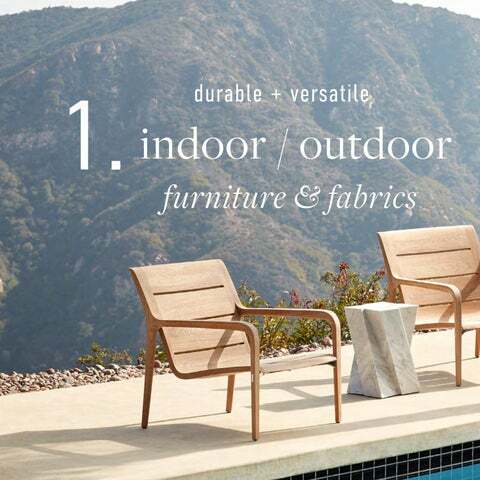 The collection combines weatherproof and durable materials with a timeless, Scandinavian-style teak frame to create a collection that is both visually striking as well as comfortable and welcoming. clarence house The Spring 2019 Clarence House Collection is a r i c h l y l a ye r e d eclectic collection of sophisticated e m b r o i d e r y, p r i n t a n d w ove n f a b r i c s . T h i s collection will bring timeless style to any dĂŠcor indoors or outdoors. aqua velvet iii GREAT OUTDOORS AQ U A V E LV E T I I I i s o u r n e w e s t o u t d o o r ve l ve t q u a l i t y, a v a i l a b l e i n 1 1 c o l o r w a y s . T h e h a n d f e e l s a s l u xe a s c o t t o n ve l ve t , b u t h a s t h e d u r a b i l i t y o f o u r G r e a t O u t d o o r s p r o d u c t , m a k i n g i t t h e i d e a l t ex t i l e for indoor and outdoor uses. no hard feelings PERENNIALS FABRICS No Hard Feelings is a sophisticated collection of innovative performance fabrics that are incredibly soft to the touch. With a focus on blended colors and exciting weaves, the collection is intriguing, indulgent, and capable of handling indoor mishaps and outdoor elements. palme botanique DESIGNERS GUILD | OUTDOOR Discover the Spring/Summer Outdoor Collection from Designers Guild - a timeless scope of practical indoor outdoor fabric designs featuring selected signature prints as well as gorgeously tactile textures and shaded plains in a range of colors. All designed with the outside in mind, these fabrics are soil & stain resistant, water repellant, breathable, and have a high resilience to chlorinated water and sea water. st. moritz GREAT PLAINS Inspired by the landscape of the winter in the Alps, the St. M o r i t z C o l l e c t i o n t a k e s H O L LY H U N T n e u t r a l s i s a n e xc i t i n g new direction. Rose Quartz, Aloe and Serenity Blue are further ex p l o r e d , w h i l e w e ex p a n d u p o n s n o w y w h i t e s , l i n e n - l i k e n e u t r a l s and cool greys. in d oor/ou td o o r PRINTS & WOVENS S c h u m a c h e r c o n t i n u e s t o r e d e f i n e I n d o o r/O u t d o o r t e x t i l e s w i t h a n ever-expanding portfolio of stylish fabrics that defy the elements. This collection, with its earthy palette and woven patterns, is all about subtlety and texture. From modern geometrics to tribal motifs, these designs let you create beautiful, enduring schemes for indoors and out. 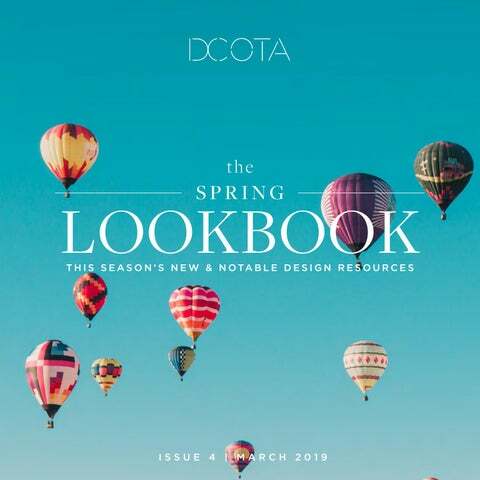 osborne & little Spring 2019 from Osborne & Little features glamorous patterns and dazzling colors through its new collections of silks, velvets, wools, embroideries, large-scale wallcoverings. Click to see more from each new O&L collection, available exc l u s i ve l y t h ro u g h t h e Ammon Hickson showroom. Ta k e a v o y a g e t o f a r a w a y lands with the exquisite new collection from Manuel Canovas. The French design studio takes inspiration from Matisse this s e a s o n f o r h i s u s e o f b o l d c o l o r, s h a p e s a n d l aye r s . L i ke t h e exo t i c fabrics depicted in his paintings, this range of vivid designs has decorative flare, refined graphic motifs and textural plains. 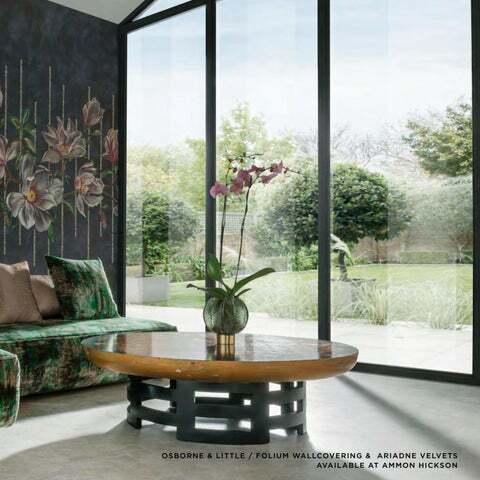 ve ronese DESIGNERS GUILD This season, inspired by the beauty of 16th century Ve n i c e a n d t h e f r e s c o e s o f Ve r o n e s e , w e c e l e b r a t e a new and contemporary language of flowers, texture, light and pattern. The result is a collection imbued with modernity and a quiet, compelling beauty - the perfect mix of contemporary and classicism in layers of s o f t , n e u t r a l c o l o r. D i s c o v e r new shades of spearmint, pistachio, vanilla, rose and olive, with tints of sky blue, s i l v e r y g r e y, c h a l k a n d p e o n y.
T h i s n e w O m exc o c o l l e c t i o n t a k e s yo u t o t h e exo t i c i s l e o f A r u b a . A r u b a e vo k e s t h i s precious planet, reminds us of its ephemeral dimension, and tells us to remember its territories and colors: t h e p u r i t y o f i t s w a t e r, the light, the palm trees, the warmth of the sand. Aruba recognizes craftsmen who respect and privilege n a t u r a l m a t e r i a l s ( w e a ve s of waterlily and raffia). paradis barbares CHRISTIAN LACROIX “Paradis Barbares” pays tribute to Garouste and Bonetti, two prominent figures from the ‘New Barbarians’ artistic movement who designed the original haute-couture salon interiors and unique furniture pieces for Christian Lacroix, in the late 1980’s. The collection celebrates the natural harmonies, free forms and rhythms of a whimsical and spirited world, with curves and waves reminiscent of Jacques Couëlle’s architecture - all seen through the inimitable Maison Christian Lacroix eye. primitive beauty Feeling a bit of wanderlust? Schumacher â&#x20AC;&#x2122;s new Primitive Beauty collection celebrates colorful tribal motifs and fascinating textile traditions, allowing you to create romantic, layered rooms that youâ&#x20AC;&#x2122;ll never want to leave. Deep, rich tones and sophisticated textures give these fabrics and trims a cultivated, world-traveled spirit. W h e n yo u n e e d l e a t h e r t o t a ke c e n t e r - s t a g e , B i g F o o t m a ke s a b i g s t a t e m e n t . I t s l a rg e n a t u ra l g ra i n w i t h d i s t i n c t i ve h a n d - t i p p i n g d e l i ve r s a p owe r f u l i m p a c t . I n s p i re d by t ex t u re s a n d c o l o r s f o u n d i n s p i c e m a r ke t s , B i g F o o t â&#x20AC;&#x2122;s g ra i n a n d s o f t , s u p p l e h a n d m a ke i t a p e r f e c t c h o i c e f o r residential and hospitality settings. Proof positive that this pattern is cinematic: It was designed for S i g o u r n e y We a v e r. “ S h e c o l l e c t s a n t i q u e Hawaiian textiles, and the designers decided to make a wallpaper out of o n e ,” J o h n F o n d a s s a y s i n t h e P r i n c e o f Patterns feature of the February 2019 edition of House Beautiful. W h y I t Wo r k s : “ T h e r e ’ s a c l e a n n e s s about Hawaiian textiles that looks fa n t a st i c ,” s ays Fo n d a s , w h o recommends the pattern for a powder r o o m , h a l l w a y, o r d i n i n g r o o m .
PETER DUNHAM TEXTILES P e t e r D u n h a m Te x t i l e s i s d e s t i n a t i o n f o r c o l o r f u l , inspired prints for indoors and out, eye-catching Sunbrella performance wovens, and impactful wallpapers and grasscloths. Here, one of the newest p r i n t s , “ Co l l a g e,” swa t h e s D u n h a m ’s ro o m a t t h i s year ’s Kip’s Bay Show House in Palm Beach. bird and swing B r u n s c hw i g & F i l s c a r r i e s o n i t s t ra d i t i o n o f exce p t i o n a l design with the introduction of Bird and Swing handblock. Inspired by a pastorale toile document from the early 1900s, this delicate pattern features a charming ribbon swag, creating a vignette portraying playful scenes of floral vases, birds and children swinging innocently in a yard. the riviera collection SUZANNE KASLER Lee Jofa takes you on a journey through the French countryside with i t s l a t e s t c o l l e c t i o n w i t h S u z a n n e K a s l e r, R i v i e r a . I n s p i r e d b y K a s l e r â&#x20AC;&#x2122; s travels, this collection of fabric and trim represents the coastal designersâ&#x20AC;&#x2122; fresh approach to classic design, featuring her signature sunset palette, as well as more traditional hues. a m u s e m e n ts KATE SPADE Kravet introduces its second collection with iconic lifestyle brand kate spade new york: Amusements. Featuring a playful mix of signature bold, spontaneous prints and woven geometrics, this collection is layered with sophisticated boucle and velvet textures, as well as innovative and w h i m s i c a l d r a p e r y.
fever carpet BOUSSAC The Fever carpet is inspired by the fabric of the same name, part of the Boussac Spring 2019 collection. abstract composition of scale that exalts the dynamics of gesture, the expression of the brush is created thanks to defining flecks of worsted wool and natural silk. luminance An abstract design created with hand carded and hand spun Tibetan wool, linen, and silk. Through the artful manipulation of color and texture, Luminance offers an interpretation of the organic imperfection of natureâ&#x20AC;&#x2122;s s l o w d e s t r u c t i o n . Av a i l a b l e i n t w o colorways, Mint and Rusty Slate. Tu f e n k i a n ’ s ‘ U n t i t l e d ’ C o l l e c t i o n i s a daring experiment in contemporary design. Random yet purposeful combinations of bold colors and specialty materials come together to create modern art work. A b a l a n c e o f c o l o r, t e x t u r e , a n d l u s t e r give them a sculptural beauty and evoke the energy of the Abstract Expressionists who inspired them. rebel silk Rebel Silk accomplishes with fiber and knots what was once thought impossibly p a ra d ox i c a l : to b e co n s i ste n t l y non-conformist. By evolving ancient Tibetan carpet weaving practices, the Rebel Silk process ensures that each rug possesses a unique and s a c r e d g e o m e t r y, o n e t h a t i s complimented by infinite hues of delicately hand dyed silk. solar shades which offer UV protection, fade prevention and glare reduction. Created with high-performance Sunbrella fabrics, the collection is stain resistant and easy to clean. The collection is available in a range of neutrals with different levels of light filtering. petra rock crystal Celebrate spring with our inspirational Petra Rock collection and feel the energy and brilliance that crystal brings to luxurious d e s i g n . P l a y i n g w i t h s a m p l e s o f s m o k y, m i l k y a n d p o l i s h e d r o c k c r y s t a l , m i n e d f r o m t h e m o u n t a i n s o f B r a z i l . We c r a f t l i g h t i n t o a r t .
ro ck cr ysta l Add luminosity to your home. Shown here w i t h p i e c e s f r o m o u r H E R I TA G E c o l l e c t i o n s . Also available across our CONTEMPORARY and TRANSITIONAL lines, with your choice of 21 metal finishes and an array of optional semiprecious stone accents. laura kirar The new Laura Kirar collection for Baker includes pieces that are functional works of art, paying homage to ancient Mayan architecture with lower proportions and weighty geometric forms evoking the simple pleasures that define casual l u x u r y. I n c l u d e d a r e p e r f e c t e d s i l h o u e t t e s that work in harmony with designs in her previous collections. boutique free standing unit Beyond the closet, eggersmann brings soul to y o u r w a r d r o b e . Ta i l o r m a d e i n e v e r y a s p e c t , we work with each client to personalize their space to make dressing and attire a special occasion. This boutique style, free standing unit is the crown jewel. Aluminum and glass infused cases are available in a wide range of colors, tints and sheens. matelassĂŠ MatelassĂŠ is considered an art-fabric in France. It is in essence a weaving or stitching technique yielding a pattern that appears quilted or padded. This technique is the highlight of this closet collection from Florense. Smart accessories offer perfect solutions in the use of space and with the functionality of closets. Luxurious, engraved, handles provide a final touch of sophistication. f53 kitchen T h e F l o r e n s e f 5 3 i s a n e w, m o d e r n k i t c h e n concept that innovates the cooking habits with a unique look, resetting the kitchen environment as the center of the home. glass floating sideboard FRAME CONCEPT FOR THE PURE KITCHEN SieMatic designs furniture to complement kitchen and open living environments. The sleek horizontal lines of this floating sideboard in black glass cabinetry surrounded by white lacquer frame is perfect for transitioning between spaces. o p e n sh elving CLASSIC COLLECTION Elegant glass and nickel gloss open shelves are a sophisticated design element to showcase and organize your favorite home accessories. A modern update for the luxury kitchen backsplash, glass metal shelves framed in high gloss nickel (shown) are also available in matte black and gold bronze. unique stone 2019 celebrates the 111th year of eggersmann producing the most exceptional quality G e r m a n c a b i n e t r y. O u r f o c u s a n d d e d i c a t i o n t o innovation and handcrafted materials continue t o e v o l v e . We h a v e r e n e w e d o u r c o m m i t m e n t to nature with our expanded Unique stone selection, and our brand-new forged metal materials. umbra matte lacquer PURE COLLECTION Old world meets modern style in this dream kitchen. This splendid old Hamburg building features a contemporary SieMatic Pure kitchen with 6.5 mm f r a m e d f r o n t p a n e l s i n t h e n e w c o l o r, U m b r a m a t t e l a c q u e r. S l i d i n g d o o r s i n t h e c e n t e r t a l l c a b i n e t s conceal appliances when not in use. 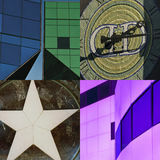 Make a bold statement with Hans Krugâ&#x20AC;&#x2122;s newest Titan color option for metal-framed glass cabinets and lacquers. Incorporate the dark, provocative glass in your kitchen or build a closet that will make your friends envious. Titan matte lacquer contrasts beautifully with our veneer finishes for stunning kitchens or use it on its own to give your bathroom a serene, spa-like feel. +segmento y W i t h + S E G M E N T O Y, Poggenpohl is creating a stunning reinterpretation of a current collection. The kitchens are matte i n s t e a d o f g l o s s y, w i t h n e w nanotech surface technology to prevent fingerprints. In limited space in the city or a spacious area in a country home. This what new luxury l o o k s l i k e t o d a y.
goa t skin a n d m a ca ssa r eb o ny Goatskin and Macassar Ebony expanded dining table, surround by twelve tall back ergonomic design chairs - custom quilted backs and one shaped leather arm = Gourmet furniture d e s i g n & i n te r i o r s by J a i m e Pe rc ze k I S F D.
One-of-a-kind textures, woods, colors and shapes all custom created for luxury superyacht Nadan with a mix of Art Deco and Biedermier styles. Custom furniture design & interiors by J a i m e Pe rc ze k I S F D.
ARS acoustical room system Acoustically treating a home cinema doesnâ&#x20AC;&#x2122;t have to be u g l y ! C i n e m a Te c h â&#x20AC;&#x2122; s A R S A c o u s t i c a l R o o m S y s t e m p r o v i d e s the best acoustical performance of any sound treatment on t h e m a r k e t , w h i l e s t i l l m a i n t a i n i n g w o r l d - c l a s s b e a u t y. A R S can be incorporated into any theater installation without impacting the aesthetics of the space. Bring color, life, pattern, and personality to any space this season. Durable & versatile indoor/outdoor furniture & fabrics available at DCOTA Showrooms.